This conversation on Fast Play was sponsored by the New Jersey Lottery. Learn more about our disclosure policy here. The New Jersey Lottery has just introduced Fast Play, a new series of quick play games. Fast Play games are printed from the New Jersey Lottery terminal at your local lottery retailer. There is no selecting numbers, waiting for a drawing, or scratching required – Fast Play tickets print out ready for you to look over and determine if you are a winner. and I hear that a $10 Fast Play game is in the works as well! 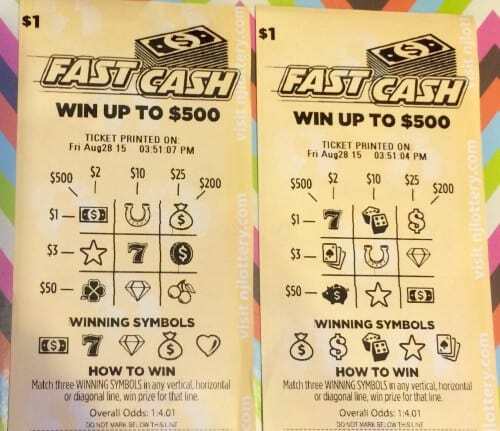 I couldn't wait to get my hands on the new Fast Play tickets – the day I first heard about them I went right over to my local Quick Chek and asked the cashier for 2 Bling Bling Bucks, 1 Slots of Fun, 1 Red Hot Numbers, and 2 Fast Cash tickets. Six tickets total for just $15*. I told myself I had to wait until I got home to look over the tickets, but to tell you the truth, it was all but killing me not to look at them right there in the parking lot! I made it back home and sat down to review my tickets. I started with the Fast Cash tickets. To win Fast Cash I needed to match 3 of my “winning symbols” in any vertical, horizontal or diagonal line to win the prize for that line. No luck here… onto the next game! To win Red Hot Numbers I would have to match at least 3 of my numbers to the “hot numbers” but unfortunately I only matched 1 number. No worries though, I still have 3 more tickets! Slots of Fun time! I must say, the title of this ticket is my favorite – love the play on words. Ok, so in this game the object is to match 3 winning symbols on a single slot reel or match 2 winning symbols and one crown for a double win. No luck on this one… I hope the $5 tickets bring me some luck! 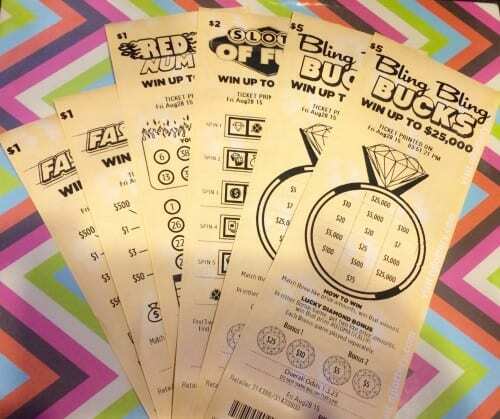 Time for my $5 Bling Bling Bucks games. To win this game I must match 3 like prize amounts inside the giant diamond ring. There is also an opportunity to win up to 2 bonus games on each ticket. To win the bonus game you must get 2 matching prize amounts. Hooray! 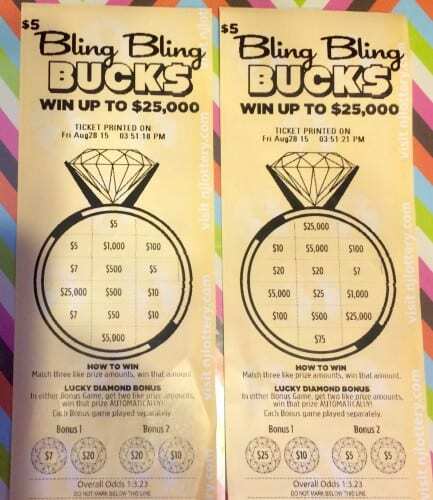 I got lucky on not one but BOTH Bling Bling Bucks tickets! I won $5 on each – one win from the regular game and the other from a bonus game. Although I didn't win back my $15 investment, I did win $10. And I bet you can guess what I will be doing with my $10 winnings — that's right, Fast Play tickets, I am coming for you! But seriously, with these odds of winning and the easy nature of Fast Play, who wouldn't want to play? With no waiting or scratching required, Fast Play is really the fastest and easiest way to play and win! For more information visit New Jersey Lottery. Disclaimer: You must be 18 or older to buy a lottery ticket. The New Jersey Lottery reminds players, it's only a game…remember to play responsibly. If you or someone you know has a gambling problem, call 1800-GAMBLER®. *The funds to purchase my Fast Play Tickets were provided by Blog Meets Brand. « Does the Baiden Mitten Really Work? Is it Worth $50? This sounds awesome! I like the high chances of winning something. 🙂 Thanks for sharing this. We will be in NJ next month, so I will have to buy a few! Sounds like fun and maybe we will win? Well I don’t live in New Jersey, but I sort of wish I did! This looks like awesome – I love me some lottery tickets! How fun is this?! I have never bought a lottery ticket! I used to work in New Jersey but don’t anymore and no way would I cross the GW Bridge and pay that toll which is $14 these days I think to buy a lottery ticket! Maybe New York will follow and do these kind of lottery tickets as well. My husband likes to play the lotto when there is a big jackpot. I will be telling him about this one. Actually I didn’t know how to play Lottery, seriously LOL. My husband loves to gamble, so I am sure he’d like the Fast Play. We usually go to the casino when we want to gamble. I have played and won! It was sooooo much fun! I don’t buy lottery tickets often, but this one sounds like a fun way to play. I would love to win. I’ll take anything…$5, $10, $1,000,000, whatever! I don’t get instant win tickets often, but they sure are fun to play when I do! I’m glad you won $10! If only I was lucky, but you never know unless you try. Thanks for sharing. We don’t have this lottery in TN. It looks like a fun ticket!